Ubiquitous in its adoption across every living space, every surface, gray reigns supreme as the universal shade of living well. That’s living well as suggested by its upscale polished presentation, suggestive of aspirations achieved. And wellness as defined by calm, serene settings. The understated nature of gray lends itself to intricate patterns and a range of finishes, from subtle cues flowing across a table top to the nuanced cabinet surfaces to the dramatic display of geometric florals in the floor covering. What’s new with this magically soft palate? Pops of color that introduce energy and playfulness. Greens and blues that call to mind forests and oceans, emeralds and sapphires. But the boldest accent colors of 2019 just might be citrus in origin: Think lemon bright and orange glow. Fixtures veer minimalist and contemporary, with a focus on streamlined hardware and uninterrupted illumination. Light and bright being the essential complements to an intrinsically open and airy spaciousness. Kitchens rule every roost, and you’d be hard pressed to find a design that doesn’t include a central gathering place, complete with comfy seating, for guests to watch the chef in action and sample the results. While cabinetry maintains fresh cream, white, or gray complexions, floors are becoming focal points in themselves. Look for weathered finishes, driftwood motifs reminiscent of walks on the beach, or dark, walnut hues that create a distinctive contrast in the setting. Whether fieldstone or stacked river stone, fireplaces have fully evolved into the retro world of rock facades, and with this as a room’s focal point, there’s no mistaking that the outdoors have become an integral part of every interior design. Trending to rave reviews is the funkiest new element to enter the home space: Traditional barn doors are sliding into place—sometimes as a functional working door, sometimes just a decorative conversation piece. Either way, the barn door is an unexpected throwback to pastoral calm and earthiness. All good vibes for an overarching theme of serenity. In keeping with the calming ambiance of today’s homes, master baths have traded their boxy, formulaic design for more spacious, open-air environments. 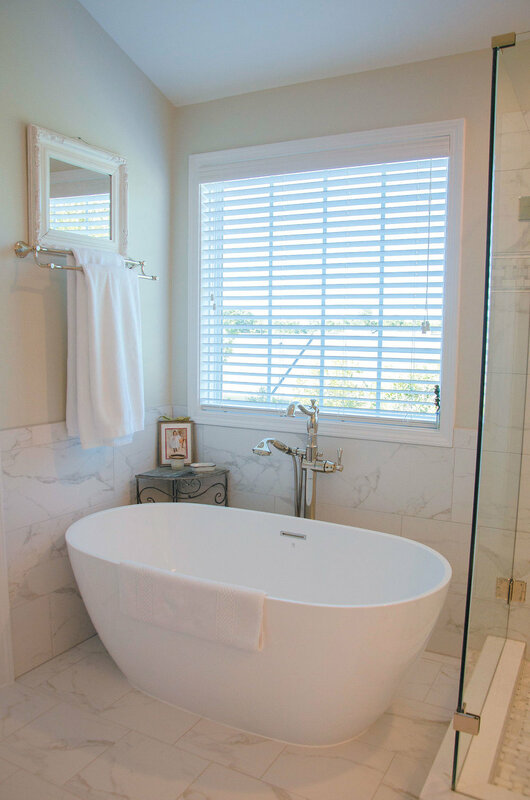 And what steals the show is the luxurious standalone tub—deep and wide, with clean lines, contemporary fixtures, and the promise of peaceful relaxation.